IT HAS taken the Japanese government more than 18 months to pay tribute to a group of brave men, once known as the “Fukushima 50”, who risked their lives to prevent meltdowns at the Fukushima Dai-ichi nuclear power plant from spiralling out of control. The media attention is always focused on those in power, who typically do nothing to merit the recognition. The multitudes on the frontline, who put their heads down and do all the hard work are treated as faceless, nameless and ultimately forgotten. with the writer calling it "one of the tragic flaws of modern Japan". I seem to be already hearing an "It is the same everywhere in the world, not just Japan" chorus, but as the writer points out in the article, it may be only in Japan where these workers themselves and their families are bullied by people around them for having tried their best to contain the nuclear disaster in Fukushima. For the case of TEPCO workers at the plant, see my post from February this year. The article in that post was written by a reporter from Germany's Spiegel. I think hardly anyone in Japan paid any attention to the Spiegel article. It will be the same with The Economist's article. It doesn't occur to many that the workers have been treated poorly, not only by TEPCO and by the government but also by ordinary people like them. See no evil, hear no evil. IT HAS taken the Japanese government more than 18 months to pay tribute to a group of brave men, once known as the “Fukushima 50”, who risked their lives to prevent meltdowns at the Fukushima Dai-ichi nuclear power plant from spiralling out of control. But when the prime minister, Yoshihiko Noda, belatedly offered official thanks to them on October 7th something strange was afoot: six of the eight men he addressed had their backs to the television cameras, refused to be photographed and did not introduce themselves by name, not even to Mr Noda (see the image below). There are numerous ways that this incident reflects badly on both Tepco’s and the government’s handling of the situation. Firstly, there is the contrast between the frontline worker’s behaviour and the brazen hypocrisy of Tepco’s management after the accident. I remember Tepco’s then-chairman, Tsunehisa Katsumata (now thankfully retired), nonchalantly blaming everyone but himself when giving testimony to a Diet commission earlier this year. Meanwhile, the men who worked loyally for him, risking their lives on behalf of his company, still hide their heads in shame. The government, for its part, has done these men a huge disservice by not acting more quickly to differentiate their heroism from the craven self-interest of the company’s bosses. In the eyes of the public there ought to be no confusion between the two. In Chile, it was easy to see how the country made heroes of the 33 trapped mine workers in 2010, while making villains of their bosses. Nothing like that has happened in Japan. As one government official noted, if this were America, the “Fukushima 50” would have been invited to the Rose Garden for presidential recognition. Yet even after Mr Noda’s visit, the men do not get the recognition they deserve. Kyodo, a news agency, relegates any mention of them to the bottom of a boring story about decontamination. An English-language paper, the Japan Times, today at least tells part of their harrowing story, though it doesn’t mention the refusal of all but two of them to be identified. They did not depict themselves as heroes, as they recounted their experiences to Mr Noda. They mostly sounded plain scared. One said he thought “it was all over” after the tsunami of March 11th, 2011 knocked out all the power. Another told of how he sent his staff out into the dark, where they faced the danger of electrocution, to restore the power to a nuclear reactor on the verge of melting down. He was asked by his men whether he thought they would come back alive. They went on regardless. But the headlines, ultimately, refer back to Mr Noda, not to the Fukushima 50. He gets more of the credit than they do, despite his wooden acknowledgement to the men, that “Thanks to your dedication, we have managed to preserve Japan.” This is one of the tragic flaws of modern Japan. The media attention is always focused on those in power, who typically do nothing to merit the recognition. The multitudes on the frontline, who put their heads down and do all the hard work are treated as faceless, nameless and ultimately forgotten. The Economist writer is highly critical of the TEPCO top management, rightly so. But even there, having watched TEPCO's press conference in March last year almost every night and having watched some of the teleconference video TEPCO finally released, I cannot make a sweeping criticism. The Norwegian committee should have asked citizens in Greece and Spain at least. The same committee awarded the current US president the same prize for his presidential campaign in 2008. Past recipients for Nobel Peace Prize include Henry Kissinger, Jimmy Carter, Dalai Lama, Intergovernmental Panel on Climate Change (IPCC). To be on the candidate list for a Nobel Prize, someone has to nominate the person or entity to the committee. I wonder who nominated the EU. As the Reuter article below notes, Norway is not part of the EU, and is doing very well. The article also duly notes an infuriated Greek citizen. (Reuters) - The European Union won the Nobel Peace Prize on Friday for promoting peace, democracy and human rights over six decades in an award seen as a morale boost as the bloc struggles to resolve its economic crisis. The award served as a reminder that the EU had largely brought peace to a continent which tore itself apart in two world wars in which tens of millions died. The EU has transformed most of Europe "from a continent of wars to a continent of peace," Nobel Committee Chairman Thorbjoern Jagland said in announcing the award in Oslo. "The EU is currently undergoing grave economic difficulties and considerable social unrest," Jagland said. "The Norwegian Nobel Committee wishes to focus on what it sees as the EU's most important result: the successful struggle for peace and reconciliation and for democracy and human rights." Jagland praised the EU for rebuilding Europe from the devastation of World War Two and for its role in spreading stability after the fall of the Berlin Wall in 1989. While welcomed by European leaders, the award will have little practical effect on the debt crisis afflicting the single currency zone, which has brought economic instability and social unrest to several states with rioting in Athens and Madrid. On the streets of the Greek capital, where demonstrators have burned Nazi flags to protest against German demands for austerity, the award was greeted with disbelief. "Is this a joke?" asked Chrisoula Panagiotidi, 36, a beautician who lost her job three days ago. "It's the last thing I would expect. It mocks us and what we are going through right now. All it will do is infuriate people here." The prize, worth $1.2 million, will be presented in Oslo on December 10. It was not immediately clear who from the EU would be there to collect the cheque and what it would be spent on. Conceived in secret at a chateau near Brussels, what is now the European Union was created by the 1957 Treaty of Rome, signed with great fanfare in the Italian capital's 15th century Palazzo dei Conservatori. The six-state 'common market' it founded grew into the 27-nation European Union ranging from Ireland's Atlantic shores to the borders of Russia. At the time the Cold War was in full swing after Soviet tanks put down an anti-communist rebellion in Budapest. Western countries led by the United States had formed NATO and the Kremlin responded with the Warsaw Pact. But the EU is now mired in crisis with enormous strains between capitals over the euro, the common currency shared by 17 nations and created to further economic and monetary union. Politicians in Germany, one of the main forces behind the foundation of the EU, were delighted with the award. German Chancellor Angela Merkel, Europe's most powerful leader, said it was a "wonderful decision". French President Francois Hollande, whose country has with Germany formed the EU's main axis of power, said it was an "immense honor". Helmut Kohl, the chancellor who reunified Germany and pushed the country into the euro, said: "The Nobel Peace Prize for the EU is above all a confirmation of the European peace project,"
After centuries of war on the continent the EU has been at peace within its borders, but its effort to stop war in former Yugoslavia -- an initiative hailed by one minister as "the hour of Europe" -- was a failure. The British government, less committed to the European ideal than other EU members, made no comment on the prize. Ed Balls, a senior member of the opposition Labour Party, remarked sarcastically: "They'll be cheering in Athens tonight, won't they?" Nigel Farage, leader of Britain's fiercely eurosceptic UKIP party, added: "This goes to show that the Norwegians really do have a sense of humor." In Madrid, Francisco Gonzalez expressed bafflement. "I don't see the logic in the EU getting this prize right now. They can't even agree among themselves," the 62-year-old businessman said. In Berlin, public relations worker Astrid Meinicke, 46, was also skeptical. "I find it curious. I think the EU could have engaged itself a bit better, especially in Syria," she said, near the city's historic Brandenburg Gate. In the home of the peace prize, many Norwegians are bitterly opposed to the EU, seeing it as a threat to the sovereignty of nation states. "I find this absurd," the leader of Norway's anti-EU membership organization Heming Olaussen told state broadcaster NRK. Norway has twice voted "no" to joining the EU, in 1972 and 1994. The country has prospered outside the bloc, partly thanks to huge oil and gas resources. Among those tipped to win was Russia's small Ekho Moskvy radio, a frequent critic of the Kremlin. Editor in chief Alexei Venediktov conceded the prize to a worthy winner. "We are only 115. They are 500 million. It is an honor (to lose to the EU)," he told Reuters. The award money of $1.2 million is probably enough to hire one or two technocrats at Brussels for a year or so. 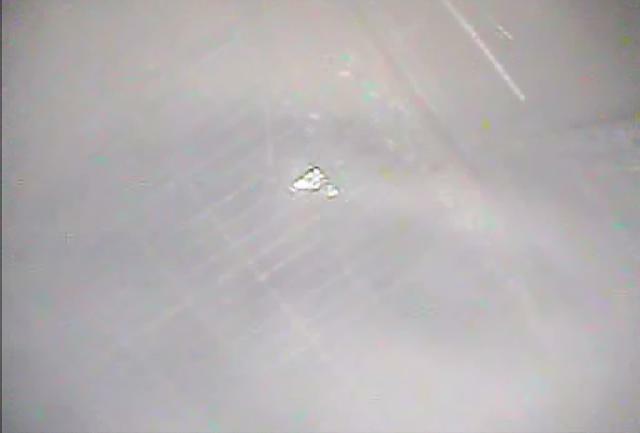 It took 51 workers (from TEPCO and Hitachi-GE Nuclear Energy, most likely) 3 hours on October 11, 2012 to probe again the Containment Vessel of Reactor 1 at Fukushima I Nuclear Power Plant. TEPCO's handout for the press (Japanese, 10/11/2012) says the maximum radiation exposure for the workers was 1.83 millisievert. 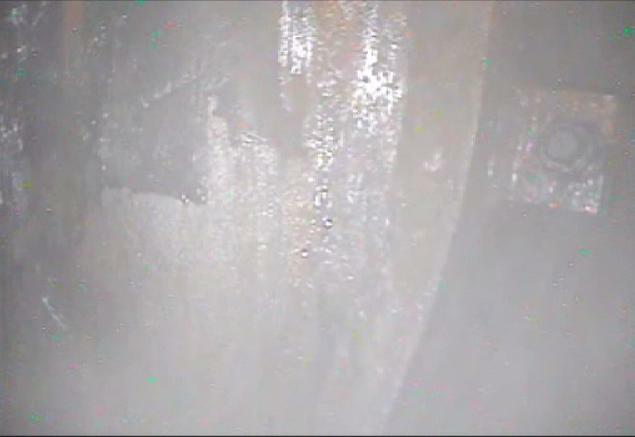 TEPCO does not say how many groups of workers went in, and how long each group spent inside the reactor building. Tomorrow (October 12), TEPCO will send in the workers again (no information if they are the same ones who have been going there every day since October 9) to collect water samples. On October 13, the workers will go there again, and install a thermocouple and a water gauge inside the Containment Vessel, again using the same penetration. It is simply infuriating to think all this work may not have been needed if enough people at TEPCO had dared to break the rules and social niceties on March 11, 12, 13. Even more infuriating that most Japanese still don't get it. The company released the data on dose rates inside the CV and two videos (one is an abbreviated 3-minute video, the other is the full-length, over 2 hours) on October 10, 2012. The highest level of radiation inside the CV was recorded right outside the X100B penetration tip, at 11.1 Sieverts/Hour. 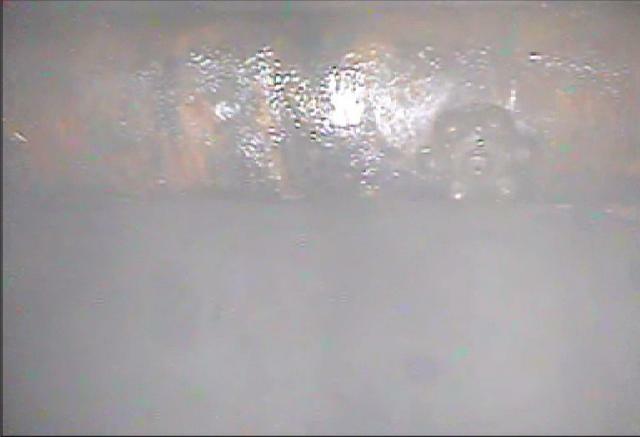 According to TEPCO, the maximum radiation exposure for the workers was 2.13 millisieverts. That was much lower than the planned exposure of 10 millisieverts. The workers went in in several groups, so their exposure was nowhere near the 2-plus hours it took for the operation. 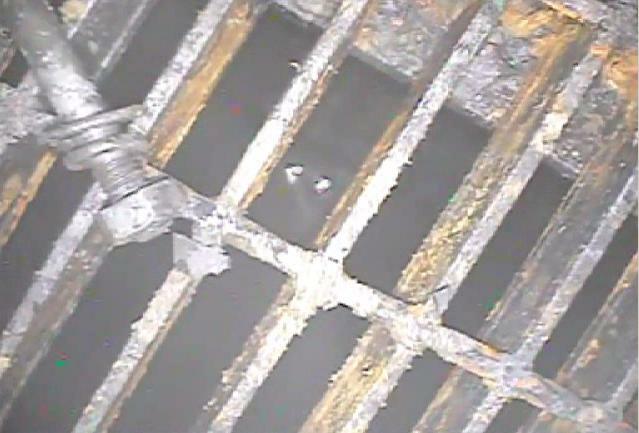 TEPCO will measure the radiation levels in the water under the grating, on October 11, and will collect the water sample on October 12. So, when Prime Minister Noda went to the plant and gave a talk to the plant management on how progress had been made, the workers (TEPCO and Hitachi-GE Nuclear Energy) were preparing for this work which might expose them to 10 millisieverts in short time. Frozen strawberries served in school lunches in kindergartens and schools in Berlin and other cities in eastern Germany have been identified as the culprit. Norovirus has been identified from the strawberries. The food distributor says frozen strawberries were imported from China, according to NHK News. 44 metric tonnes of them, according to Germany's Spiegel. Experts now believe that frozen strawberries from China are behind a massive outbreak of the norovirus that recently affected thousands of schoolchildren in eastern Germany. The episode merely illustrates the deplorable state of school lunches, a problem no one seems willing to fix. The first school lunch that Martha Payne photographed in May consisted of a croquette, a small pizza, a bit of corn and a muffin. The nine-year-old from Scotland gave the meal six out of 10 points for taste on her "food-o-meter" and four out of 10 for healthiness. Her plan had only been to take a shot in order to show her father that the meal wasn't enough to fill her up, she wrote on her blog. After only a week, Payne had 25,000 hits on her blog, and now hundreds of thousands are reading it. Whoever looks at the photos will not be surprised by the debate that has been raging in Germany for two weeks about what is actually served to children in school cafeterias. Much more amazing is the fact that it took so long to reach a crisis like the one that has happened in eastern Germany, where more than 11,000 schoolchildren were recently affected by gastrointestinal sickness -- most likely because of what they ate at school. "We already calculated long ago that an episode like this would happen because the entire system is messed up from beginning to end," says Michael Polster, head of DNSV, an association that advocates healthier school meals in Germany. "Rapidly growing demand is running up against massive cost pressure (and) absurd bureaucracy in an altogether lawless area," he says. A move by the German government in recent years to push forward an expansion in the number of all-day schools, has prompted explosive growth in the school catering business. Germany has 11 million children attending 45,000 schools, and the number of them being fed at these schools is rising. As a result, the school catering business is becoming highly competitive and growing at an annual rate of 5 percent. Already today, the five largest school catering companies generate combined revenues of some €160 million ($208 million) in the country. By far the largest of these is the French company Sodexo. Last week, the company and its products quickly fell under suspicion of being at least partially responsible for the mass outbreak of illness in eastern Germany because many of the affected establishments were supplied by its industrial kitchens. The self-described specialist in "quality of life services" offers an extremely broad range of services, from nursing care to cleaning to catering. The company's global sales are estimated at €18 billion, and its 391,000 employees make it one of the 25 largest employers in the world. The family of company founder Pierre Bellon is believed to be the richest family in France. After German reunification in 1990, Sodexo made significant investments in its Germany-based operations. The company took over a number of company cafeterias in the states that belonged to the former East Germany, including one in the city of Halle located right next to a former state-owned paint, varnish and flooring plant. To this day, plasticizers are stored in huge tanks in the courtyard near the kitchen, which is surrounded by rat traps. Signs warn about dangers to reproductive health. The French quickly became sector leaders with rock-bottom prices of €1.55 ($2) per meal and many employees working at dumping wages, according to the NGG union. Today, 65 Sodexo kitchens supply 200,000 daily meals all across Germany. Questioning of patients and analyses of the supply chain provided indications tracing the cause of the recent epidemic of diarrhea and vomiting to a supplier who provided Sodexo and at least two other catering companies with frozen strawberries from China. The batch involves 44 metric tons of the fruit that were imported into Germany via the port of Hamburg. According to the findings of a working group composed of state and local officials, "at least 10" of the Sodexo kitchens in eastern Germany had processed and failed to sufficiently heat the frozen strawberries from this delivery. Sodexo describes the episode as a "regrettable isolated case" and says that use of the goods in question was "blocked" after it was announced that the strawberries might be to blame. Late Friday evening, Sodexo's German operations issued a press release saying that it was "shocked" by the outbreak. The company added that it apologized to all affected children and families and that it hopes that the children have gotten better. In addition to pledging to improve quality control and to take other preventative measures, the company said it would "compensate those affected for the unpleasantness that occurred." On Tuesday, Germany's center for disease control, the Robert Koch Institute, declared that the contaminated strawberries had been identified and removed, but it also confirmed that one batch of the frozen strawberries had tested positive for the highly contagious norovirus. School lunches seem to be dumping grounds for cheap and/or unwanted food items, also in countries other than Japan. I'm a bit surprised that this happened in Germany. Sodexo, Inc.'s website says it is the world leader in "Quality of Daily Life Solutions". There is Sodexo South Korea, but none in Japan. So far. Speaking of frozen fruits, some cities in Kanagawa Prefecture continue to serve frozen mandarin oranges even if they have been already tested and confirmed to have radioactive cesium. Why? Because the contract with the vendor is more sacred. It seems Japan will be a great fit for the French company. Japanese Net Citizens' (Anecdotal) Response to TEPCO with No Money to Buy Batteries and No Permit to Transport Batteries: "TEPCO Should Have Used Credit, and We Need New Emergency Laws and Regulations"
One month after it was first reported by Asahi Shinbun, some Japanese net citizens on Twitter seem to be slowly realizing what happened on March 13, 2011 when Fukushima I Nuclear Power Plant workers didn't have enough money to buy car batteries which would have given them a good fighting chance. Sadly, their response to this revelation indicates to me the same thing would happen again and again. The tweets that I've seen on the subject are limited in numbers, I don't have that many followers (4,700, give or take) and I don't follow that many. So the following is nothing but anecdotal. They should have asked nicely. They should have bought on credit. Maybe the stores didn't trust TEPCO to sell on credit. I'm embarrassed for Japan, what would the world think of us Japanese? There is no indication that any of them even thought about "other" solutions (see my previous post for some). That's understandable, because we don't have laws and regulations for emergency situations like that. I think there are some who predicted it [that Toshiba or TEPCO waited for the permit while core melt was occurring]. But it is us [the citizens of Japan] who have allowed it [the lack of emergency laws and regulations] to continue. So we have to change many things, but that's hard to do. If an earthquake and tsunami of the same magnitude happened right now, it is likely that we would repeat the same [mistakes]. To him, and to many others in Japan, it is a matter of creating new laws and regulations so that people can follow follow, and NOT of individual initiative and how to start thinking independently. And thinking fast. It's not the matter of whether you have the laws and regulations in place. If a government bureaucrat told Toshiba or TEPCO they couldn't transport the batteries on the highway without the permit, even as they knew (though they dared not tell the public) the reactor core was melting, Toshiba or TEPCO could simply say, "Oh OK, yes we understand, sir", and start driving to Fuku-I anyway. People are not trained to be bold and cunning, able to make judgment on their own on the fly in a situation like that. So what they might be fined or even arrested afterwards for transporting dangerous stuff on the highway? That would have been much better than having nuclear reactors blowing up one after another. I'm afraid he doesn't know what I'm talking about. But we're in agreement as to repeating the same mistake in the future. PM Noda Visits J-Village, #Fukushima I Nuke Plant: "As a Citizen of Japan, I Thank You." So far, the news is out on his morning visit to J-Village in Naraha-machi, Fukushima, where met with workers who had remained at the plant during the early days of the nuclear accident, and thanked them for their effort. Why does he bother? Jiji says it's to show people that the Fukushima nuclear accident is still the number one priority for the administration. For what? At this point, I haven't a clue. Prime Minister Yoshihiko Noda is in Fukushima Prefecture on October 7 to visit Fukushima I Nuclear Power Plant. It will be the second time [for Mr. Noda] to visit the scene of the nuclear accident since September last year, when he became the prime minister. He has been re-elected as the leader of Democratic Party of Japan, and has reshuffled his cabinet to strengthen his position. With the visit, he intends to show that the Fukushima nuclear accident continues to be the first priority for the administration. Prime Minister visited the J-Village in Naraha-machi, which has been the staging area for the accident response work. 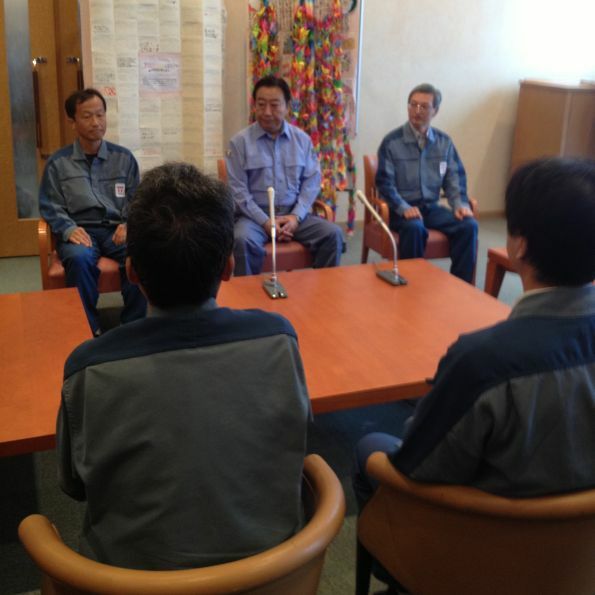 He met with the workers who had remained at the plant despite danger right after the start of the nuclear accident in March last year, and thanked them by saying, "You must have suffered such hardships that you can't even begin to tell us. I would like to thank you, as a citizen of Japan, for your strenuous effort in the middle of fear and harsh environment." I don't know if the quote by Jiji Tsushin is verbatim or abbreviation. I would have liked him to say that and more, as the prime minister of the national government whose official, national policy has been to pursue nuclear energy, instead of as one citizen. "As the prime minister, and as a citizen of Japan, I offer my profound respect and appreciation. Thank you very much." From the words, Mr. Noda seems to appreciate policemen more than the Fuku-I workers.